The Space Race, fueled by Cold War competition between the U.S. and the U.S.S.R., was a period of rapid innovation and technological advancement. First rockets, then probes, and finally humans were launched outside of Earth’s atmosphere. But in the haste of who was going to dominate the next step into space, many fatalities occurred. The U.S. lost three great astronauts — Gus Grissom, Ed White, and Roger Chaffee — in the Apollo 1 capsule during a ground test in January 1967, the same day that the Outer Space Treaty was signed. That same year the U.S.S.R. lost one of its best cosmonauts, Vladimir Komarov, when his spaceship collapsed once it entered Earth’s atmosphere and crashed on the ground with the force of a 2.8-ton meteorite. At the beginning of 1967, Leonid Brezhnev, the leader of the Soviet Union, came up with an idea for a spectacular celebration of the 50th anniversary of the Bolshevik revolution. Brezhnev had a space celebration on his mind. 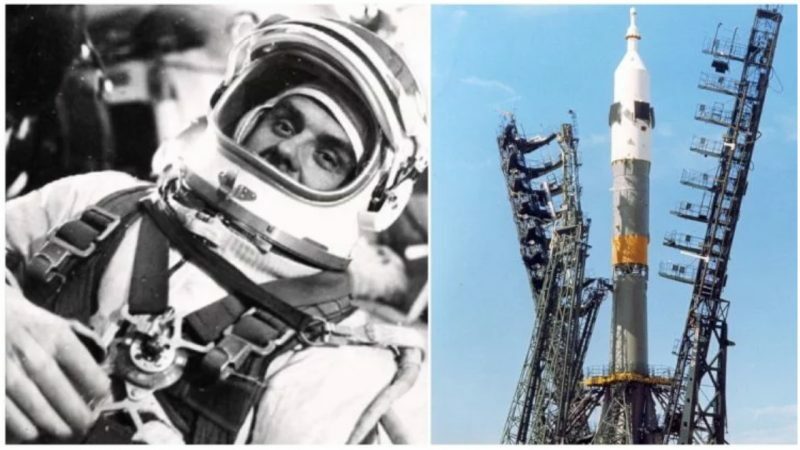 His idea was the launch of two capsules, Soyuz 1 and Soyuz 2, that would meet and dock in space and two cosmonauts would exchange places, crawling from one vehicle to the other. Brezhnev made it clear to everyone that he wanted his project realized, and nobody dared to rationalize with him that it was an unattainable project for the short deadline. 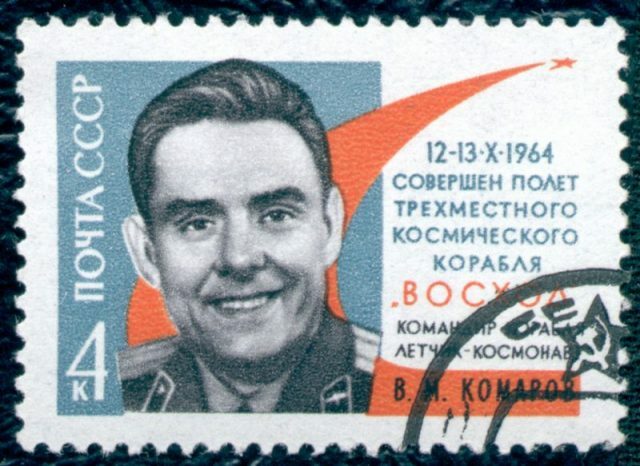 1964 U.S.S.R. postage stamp honoring Vladimir Komarov. Vladimir Komarov and the national hero Yuri Gagarin were chosen as the primary and backup pilots for Soyuz 1, the more sophisticated spacecraft. The men were best friends, working, hunting, drinking, and spending their free time together. They were both brilliant engineers and both aware of how risky and complicated the mission was. Komarov had fears that he wouldn’t come back alive, but if he backed off from the mission his friend was his substitute. 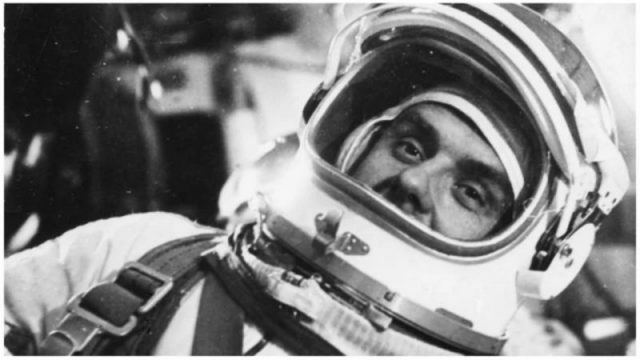 Valery Bykovsky, Aleksei Yeliseev, and Yevgeny Khrunov were the cosmonauts selected for the Soyuz 2. 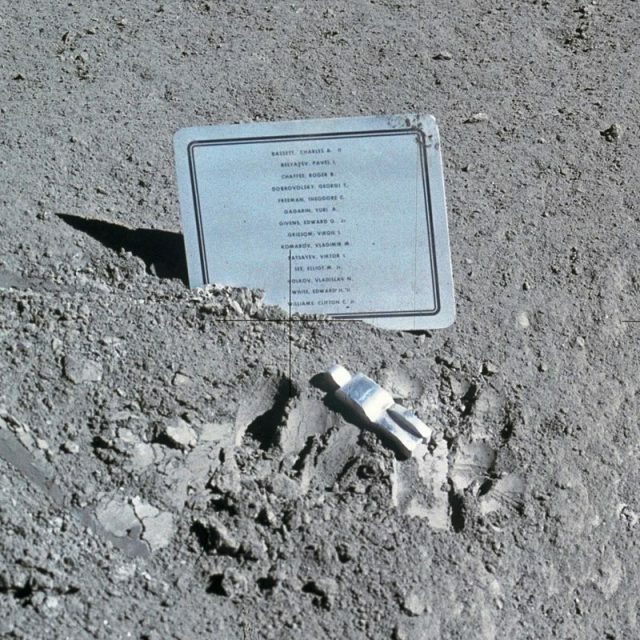 Commemorative plaque and the Fallen Astronaut sculpture left on the Moon during the Apollo 15 mission. 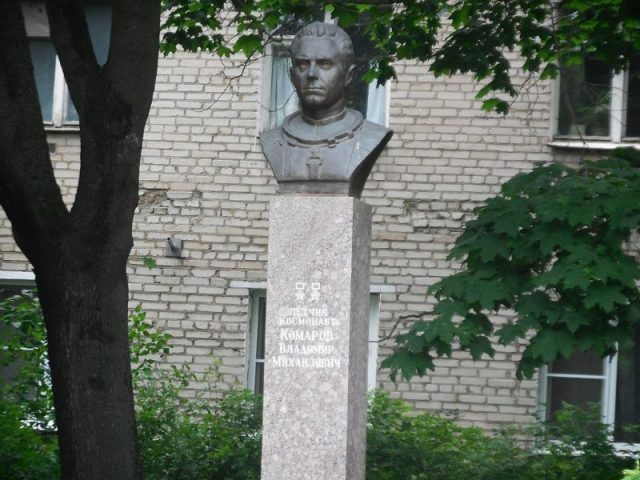 The plaque is inscribed with the names of the names of eight American astronauts and six Soviet cosmonauts (including Vladimir Komarov) who died in service. 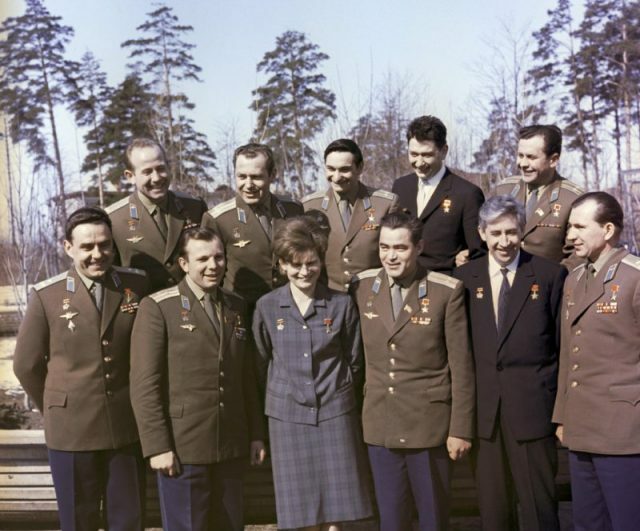 There were the Soviet cosmonauts on one side, all sharing the same concern that the project was way too risky and beyond the engineers’ capabilities to improve it by May 1, the National Day of Worker Solidarity. On the other side, there was the Communist Party eager to announce its new “first space accomplished” to the world. A team of more than 50 engineers inspected the spaceships and found 203 problems which were detailed in a 10-page memo. Even though the memo was supposed to raise awareness among the Party so that the project would be at least delayed, everyone who saw the memo was demoted, fired, or sent to diplomatic Siberia. Despite the shoddily constructed vehicle that ran dangerously low on fuel, Soyuz 1 launched on the expected date with Komarov inside. His friends and colleagues tried to cheer him with a song. Yuri Gagarin showed up and made a fuss, in a desperate attempt to save his best friend. But that as the last time they saw each other. Everyone knew that the project was doomed. Even Komarov asked for an open-casket funeral so that the Soviets would see what they had done. 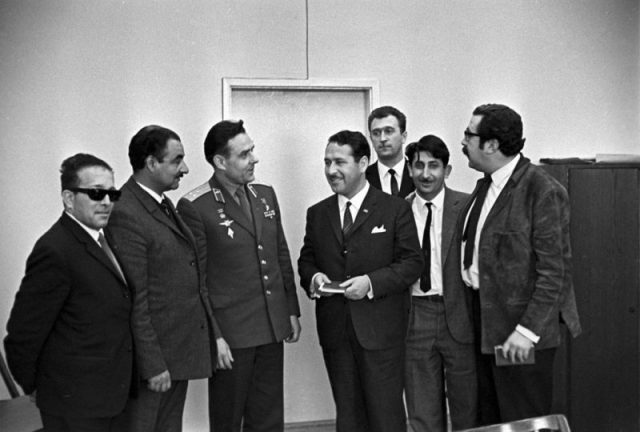 As soon as the Soyuz 1 liftoff on April 23, troubles started. One of the two solar panels failed to deploy, leaving the capsule with half power. Its antennae were also damaged and didn’t operate correctly, obscuring the navigation equipment. The thermal control system degenerated, communication with ground control broke down, and the ship spun out of control. The launch of Soyuz 2 was canceled, and instead, Komarov’s colleagues attempted to launch the capsule in order to save him. In the meantime, Komarov turned the capsule to make its descent back to Earth. But with all the dysfunctional equipment, he spent five hours in orbit. It was not until his 19th pass that he managed to fire the retrorockets and reenter Earth’s atmosphere. 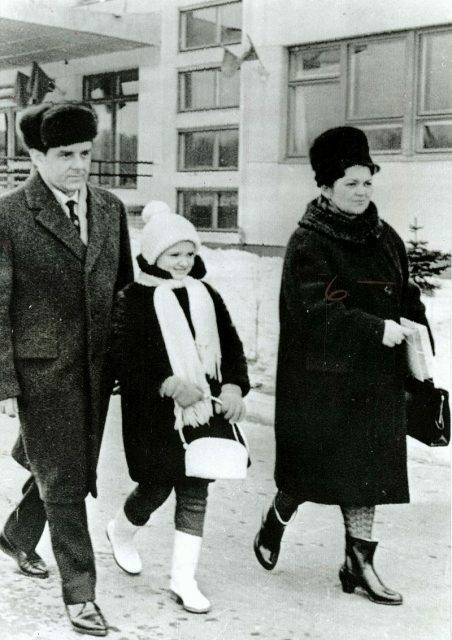 Komarov with his wife Valentina Yakovlevna and daughter Irina Vladimirovna. Everything fell apart when the two parachutes failed to deploy. Once in the atmosphere, the capsule started falling out of control and Komarov knew that this the end and there was nothing he or anyone else could do to prevent it. While falling to his death, Komarov cursed in rage accusing the Party and everyone responsible for his misfortune. Besides a call from his wife to say goodbye, Komarov’s distressed calls were picked up by U.S. listening stations in Turkey over the spotty transmissions. At 7 a.m. on April 24th, Soyuz 1 crashed into a steppe near Orenberg with the force of a 2.8-ton meteorite. Komarov was killed instantly. Nothing was left of the craft or his body but twisted metal, charred remains, and a chip of his heel. Many accidents and events in U.S.S.R. society have been shrouded in secrecy. Hence the conversation between Komarov and mission control remains as one of the greatest controversies and mysteries of the previous century. 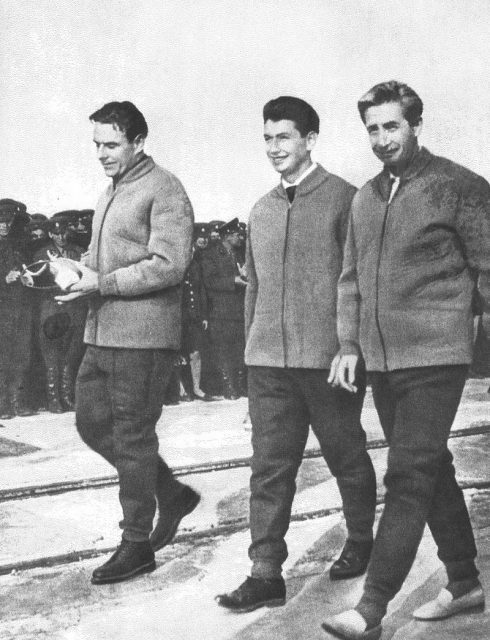 The Voskhod crew (Komarov, Yegorov, and Feoktistov) at the Baikonur Cosmodrome after the end of their mission. Komarov was honored with a state funeral in Moscow, open-casket as he required, and his ashes were interred in the Kremlin Wall Necropolis at Red Square. After his friend’s death, Gagarin gave a very risky interview to Pravda, the official newspaper of the Communist Party of the Soviet Union, where he criticized the mission. Sadly, although one of the reasons why Komarov didn’t back off from the mission was to save his friend, Gagarin died only a year later, crashing in a fighter jet on a routine flight.